The Huangs are celebrating Chinese New Year. The celebration of this holiday resulted in a great episode last year. 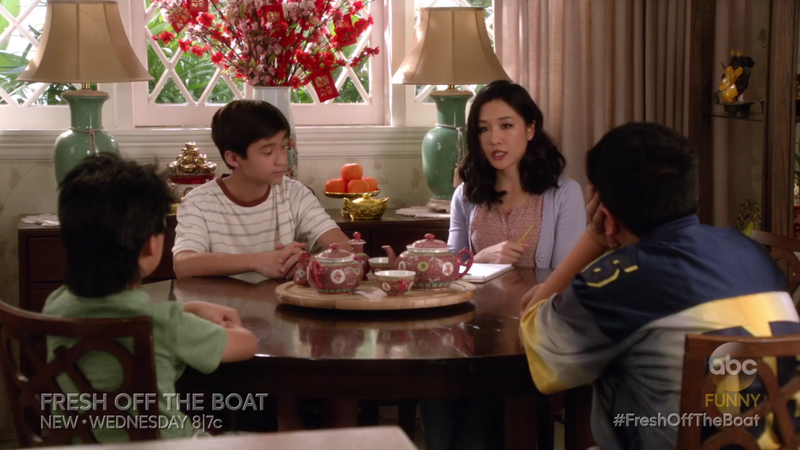 For the Chinese New Year, Jessica is excited about the family all having a clean slate, but they are worried that she will end up in a fight with someone, because she tends to. When Jessica has to go outside, she recruits Emery to help her be kind. It is hilarious when their plan is threatened by an activist. After Emery gets in a dispute with the dry cleaner, he thinks that Jessica cares more about her superstitions than him, so Jessica goes back. Evan gets a horrible haircut, so he writes a hate letter to the barber. The letter gets sent, even though Evan had intended to wait until after the Chinese New Year. It is pretty funny when Louis tries to get the letter from a mailman. Meanwhile, Eddie has to show a cousin around, who he thinks is like a grown up Evan. However, it turns out he can rap. Jessica's story was the strongest this week, though that is not to say that it was strong. There were few moments I laughed at this week, and the smaller stories didn't really go anywhere. What did you think of "Clean Slate"? Leave your thoughts in the comments!